There is a dramatic surge in client consults and training sessions after occasions like Christmas, New Year’s day, and perhaps most of all, Chinese New Year. These are happy occasions for celebration with food. With great celebration comes great food. With great food comes great weight gain. 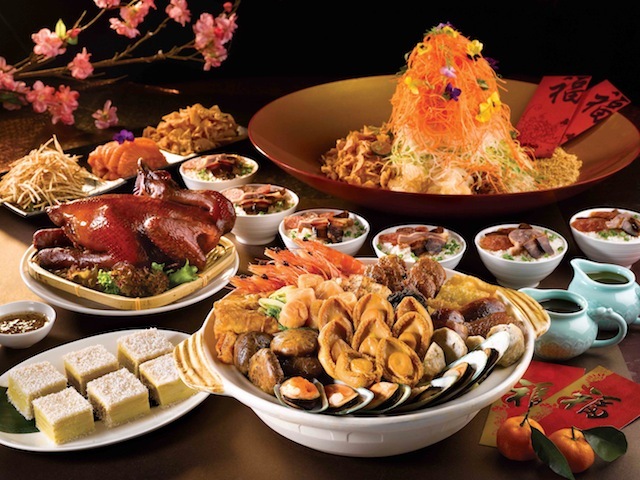 CNY is an especially ‘dangerous’ time in your battle versus the bulge and your struggle against the sugar. It’s not just a one-off like Thanksgiving Dinner or the New Year Eve booze party. It’s a multitude of visits to friends and family, each engendering great motivation to present – and eat – the most delicious, fat- and sugar-laden treats one can imagine. Hence the eater’s remorse post festivities and the desperate attempts to pay the piper by burning the fat in the gym, and the proliferation of all kinds of classes and services trying to capitalize on this guilt trip. But it’s easier to refrain from eating that extra 400kcal than it is to burn it off. What you need is a battle plan before you actually hit the festive season. If you have a strategy of what to do and what not to do, it will save you the pain of having to work off the aftermath. This two-part article aims to give you that battle plan. As with all battles, we need to understand the ‘enemy’. Maybe too great! The mark of great hospitality has always been great food… and food aplenty! When we entertain we seldom have health in mind when we plan our offerings. We think taste! Flavour! Aroma! We want to offer the widest selection of delectable possibilities, so that our guests are happy, satisfied, and impressed! All your hosts have the same well-meaning plans for you – to stuff you to the gills. The sweet irony is, the more family and friends you have, the more visits you do, and the more you partake of these spreads. It’s like punishment for popularity! How easy is it to accumulate? Let’s have a look at some typical goodies. 1 slice of bak kwa, two love letters, two pineapple tarts and 4 kueh bangkits. The total calories from this moderate amount would be 596kcal, or around 600kcal. If you weighed 70kg, this would require 60 min of running at 8kph to burn off, or assuming all calories lost from the exercise is directly taken from this surplus. Imagine you did 2 house visits per day for two days. That’s a total of 600 x 4 = 2400kcal over the public holidays, or four hours of running necessary! In terms of sugar, that’s 50g per visit x 4 = 200g of sugar over 2 days! That’s a lot of sugar for your body to handle, especially if you have diabetes! Keep in mind this example serving is actually a lot LESS than most people consume, and you can understand why the pounds get packed on. Also remember that this is in ADDITION to your regular meals: breakfast, lunch and dinner! So you will be consuming even MORE calories a day. Each social visit is a battle that can wreak great havoc on your weight loss/ physique goals. You can choose prevention or you can choose moderation. Prevention means not eating any of the temptations laid out before you. If you’ve already been living the healthy lifestyle for a while, it may be easier to do. In my experience however, it simply does not work for most people for a couple of reasons. It would be psychologically cruel to have that spread in front of you, and not taste one morsel. Repression of any sort often leads to a rebound in the opposite direction as the mind rebels, and more than makes up for earlier abstinence. It would be socially unacceptable. Do you want to hurt your grandparents’ feelings, especially if they’ve queued up for hours for the best bak kwa in town? Hence my preferred strategy is moderation. It bears repeating: It’s far easier to skip eating that 400kcal titbit than it is to burn off 400kcal. So while we’re not looking to prevent any extra intake, we’re looking to limit it. Experience has shown that force feeding people a plan never works, so it’s my philosophy to offer options, and for my clients to pick those they can follow through consistently. Here are some stratagems that have worked well for many of them. I divide them into a few different categories: A, B and C.
What you’ll do is to pick at least 1 from each, and then apply it. This gives you a strategy of 3 different things you can do. If this is too restrictive for you, just choose any combination to formulate your own battle strategy. Section A has only one stratagem, but it’s an important one that sets the stage. Temptation is there but you can’t escape the physical limitations of your stomach size. What you want to do is have something in the tank already before you visit, not go out into the world with an empty tank you can fill with potentially bad fuel. First, have a good, healthy breakfast, which is what you should be doing every day anyway. It should consist of something good and filling, such as complex carbohydrates with plenty of fibre. Good choices include oats, multi-grain cereals (not the unhealthy stuff), a wholemeal sandwich and nuts. Include protein. Not only is protein important after a night’s fast for feeding your hungry muscles, it also leads to greater meal satiety. Hard-boiled eggs, milk, and chicken slices from the last night’s dinner are good options here. This is it. The real test. The crucible. The gauntlet. The food is there in your face. What you gonna do? People eat too fast. That’s a fact in our busy world where time is everything. The problem is it takes a while for your brain to realise that you’re full. So people eat beyond what’s necessary for satiety before the brain gets the message. By slowing down while you eat, your brain can get it at about the same time. Another advantage of chewing your food is you can extract the maximum taste from each bite, prolonging the sensation, and necessitating less of the same! This might seem counterintuitive, but it’s actually the only way you can keep track of what you eat! When you start with a full plate – and decline new helpings until the plate is clean – you have an idea how much you’ve eaten. Think about it. If you always have some space on your plate, and you (or someone else) keeps adding stuff to it, you can’t estimate just how much you’ve eaten. You’ll also believe you’re eating less because you see the food taking up the plate as just a humble fraction. Those fractions add up. Try your best to fill it with the least sinful foods though! You could employ the same method (B2) to your beverages – and if you must consume alcohol then that’s one way to keep track of the number of glasses. However here’s where I want you to restrict yourself. No alcohol, no soft drinks. Just water. I’m going to go on a spiel about alcohol so bear with me. Whatever its touted benefits for the average drinker who consumes the suggested one drink per day – alcohol has just too many ills for the majority of people who would drink more than that. And even if you keep to one drink per visit, it’s two drinks for two visits and so on. It’s been en vogue to praise alcohol, but let’s not kid ourselves. For those who cite its benefits for breast cancer survivors, let’s not forget alcohol has been shown to increase cancer risk of the mouth, throat, colon and yes, breast. While it’s supposed to have heart health benefits, via increased HDL and decreased formation of blood clots, alcohol raises blood pressure, which imposes a strain on the heart. It has also been implicated in heart muscle damage, effectively the same situation as in a heart attack. It is a well-known factor in hepatitis and cirrhosis, both of which damage the very important liver over time. Your liver has important functions such as neutralizing of blood toxins, immunity to infection, important metabolic functions (for your fuel needs) and regulation of blood cholesterol. You do not want to risk damaging your liver. It impairs judgement and slows reflexes, and has been the cause of many a tragic accident. Something to consider if you’re driving from home to home especially with a family in the car. Once you’re not thinking straight, moderation and food choices also go out the window. Alcohol gives you nothing but a load of empty calories with zero nutritional value in exchange. It also prevents the body from metabolizing fat. Really quite worthless from the standpoint of weight maintenance. The psychological ills like addiction and the behavioural changes are unnatural and go directly against the AA35 philosophy of having the freedom to take control and live a Full Life. Less bad – but only just – are sweet drinks. Soft drinks, packet drinks, and cordials are just some ways you can load up on sugar and calories, which spikes your blood sugar and jacks up your waistline. Like alcohol, they load you up with empty, useless calories without any nutritional benefit. Perhaps the really dangerous thing about drinks is that they’re so easy to down. It takes a much longer time and effort to chew and swallow 400kcal than it is to just gulp it down in one go. BUT… you don’t get full with fluids alone. So you still eat, keep drinking, or both! I’m for keeping things simple. Just don’t drink. Ask for water. And if some hosts don’t actually serve it, it’s become more socially common for people to carry water bottles around. Make sure yours is filled between visits. We’ve said that you should have a good breakfast to start the day full. Likewise, you adopt a similar strategy during each visit itself. Keeping yourself partially full, you will be less able to fill up with sweet snacks even if you were inclined to. One way to do that is to sip drink water throughout, between morsels of food. It’s an easy way to take up stomach volume temporarily, but is quickly cleared by the system between visits. Another way is to snack on healthier options. There aren’t going to be very many, but one favourite that’s a safe bet at the table is nuts. Ideally, you should get a mix of nuts, and preferably, they should be in as natural a form as possible. So if you have a choice between unshelled peanuts and shelled, salted, flavoured ones, go for the former. I do mean real nuts though… not peanut cookies! B5: Avoid Some Foods – Completely! While moderation is key, there are some triggers that once you start, you can’t stop! It could be anything, and you need to know what your own are. Usually it’s something that is small, so a fistful seems okay, then another fistful, and another. It may be love letters. Pineapple tarts. Even peanuts, while healthy, add calories if you scarf down humongous amounts. It’s the same reasoning behind why some addictive behaviours like cigarette smoking are stopped using the cold turkey method. Going by halves hardly works because all many people need is just the taste of one to get them going on a chain of repetitions. That’s it for Part 1. Digest this, and I’ll be back shortly with Part 2…just in time for CNY!